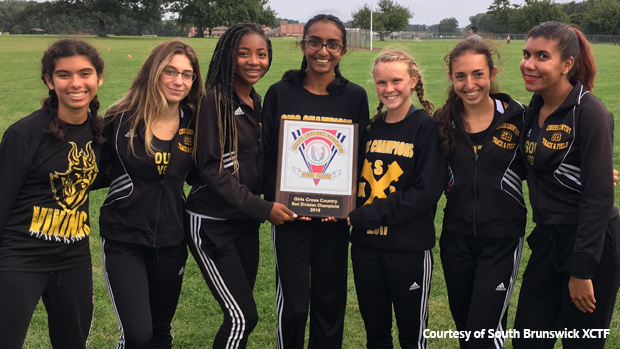 The NJ #10 South Brunswick girls, led by individual winner Nikhila Obbineni, broke a course record on the way to a decisive victory, and the Old Bridge boys won a great three-way battle at the Greater Middlesex Conference Red Division Championships on Monday at Thompson Park in Jamesburg. In the girls race, Obbineni ran a PR of 19:07.8 to lead South Brunswick to a 1-2--3-4- 14 finish and a Middlesex County course record average of 19:50.5, which broke the mark of 19:51.6 that the Vikings ran at the Central Jersey, Group 4 race last November. The Vikings ran away with the team title, 18-77 over runner-up Monroe, and will be heavily favored to win its fourth straight title at the GMC Championship meet next month. The boys race saw Old Bridge open plenty of of eyes with a great performance by its tight pack. The Knights squeezed its fourth man ahead of the No. 3 runners from East Brunswick and South Brunswick to give the Knights a 37-45-49 victory over runner-up East Brunswick and third-place South Brunswick. Old Bridge and East Brunswick averaged 17:03, and South Brunswick, went 17:08. 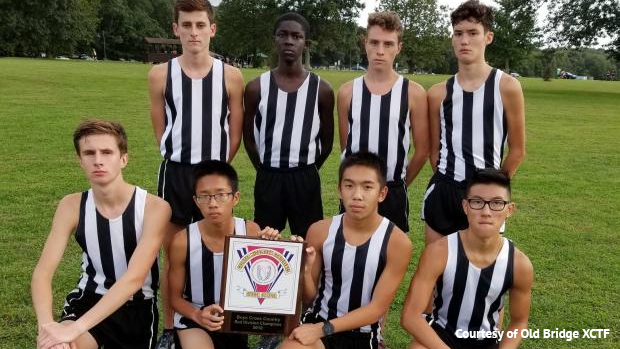 Old Bridge, led by Charles Harvey (third in 16:56), went 3-5-6-9-14 and picked up Thompson Park PR's from sophomore Steven Tan (fifth in 16:58) senior Kyle Pabalan (14th in 17:18), senior Steven Cool (17th in 17:26), and junior Brian Huang (16th in 16:27). Michael Keefe (16:59) and Tim Purcell (17:05) ran great up front for Old Bridge as the Knights had a spread of just 24 seconds between its No. 1 and No. 5 runners. In a battle between the top two returning finishers from the GMC meet last year, Reyden Davies of East Brunswick , third in the GMC meet last October, ran 16:35 to win the individual title by 10 seconds over runner-up Brandon Diaz of South Brunswick, fifth at the 2017 GMC Championships. Judging by the results from this meet, the GMC Championships on Oct. 20 at Thompson should be a thriller. Last year, the South Brunswick boys won with 72 points. east Brunswick was second with 84, Old Bridge third with 87, and Metuchen was fourth with 96.